This guide will show you the behind-the-scenes design of a train-the-trainer course. 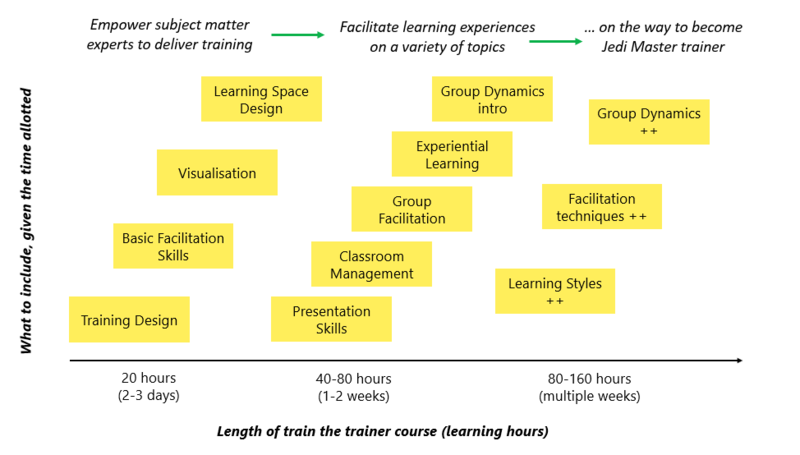 Why create a train-the-trainer program at your organisation? How to design a train-the-trainer course? What are the essential ingredients of a train-the-trainer course? With this comprehensive post, we’d like to support you on your path to designing a train-the-trainer workshop. You will find a detailed breakdown of a 7-day, intensive train-the-trainer program including essential theories and concepts, practical tips and activities. And all this with a detailed explanation of why the course is designed as it is. Put on your trainer goggles and let’s get started! In our ever-changing world, one of the biggest challenges organisations face is how to stay on top of their game while adapting to new markets, new requirements and environments. To stay competitive, their workforce needs to be up-to-date with the latest trends and technologies, so it is not uncommon for employees to attend trainings in the workplace. A lot of training sessions call for a lot of trainers. Thus, unless you have an endless budget to hire external trainers, you might be better off training your own internal experts who can transfer skills and knowledge to other employees. A competent and skilled group of internal trainers will also help a lot in supporting any future change and transformation initiatives that your organisation might undertake. Additionally, having internal trainers allows an organisation to pass on domain or organisation-specific knowledge from experienced employees to newer ones. 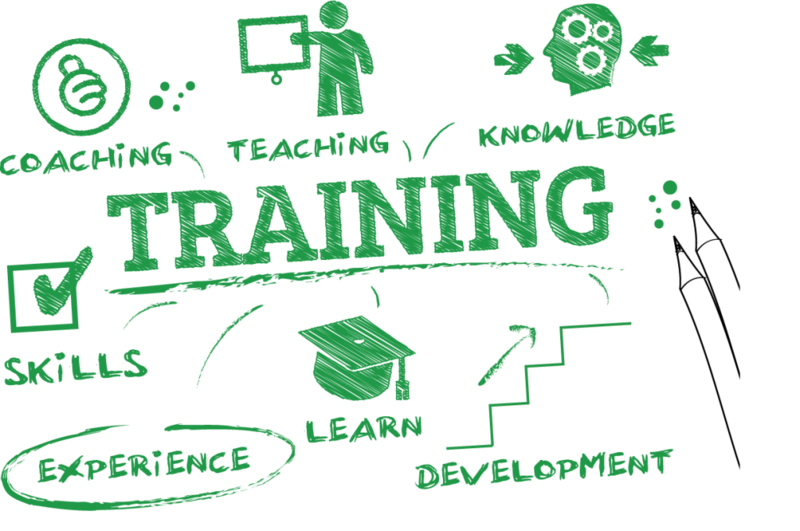 The train-the-trainer model provides an effective strategy to equip employees and subject matter experts with new knowledge on how to teach others and how to foster an environment where everybody feels welcome to improve their skills. Perhaps you need to design short, 2-3 day programs aimed at equipping subject matter experts with training design and facilitation skills. Or maybe you are preparing a 2-week-long intensive train-the-trainer course to develop competency in designing and delivering soft skill training sessions. In either case, there are a lot of interesting questions about how to build up an effective program. We have had the opportunity to observe a wide range of train-the-trainer programs at several international NGOs, and from them we have drawn some best practices outlined in the next chapters. Short intense (2-3 day event ~ 20 learning hours): This covers the essentials and is typically used to empower subject-matter-experts with basic facilitation and training design skills. The goal is to empower trainees to deliver effective training sessions in their own fields of expertise. Long, scattered over weeks: (10-20 days, usually one day per week ~ 80-160 learning hours): If you don’t have an opportunity for a live intense train-the-trainer event, then a course format with recurring weekly training days can be a great option to cover all your needs for your first train-the-trainer course. Having a week of time between each (set of) course days gives an opportunity for extra assignments and ‘homework’ activities so trainees can practice and prepare for each session. This is particularly useful if you have a diverse group of trainees who won’t need to work as a team later on but want to learn much of the advanced content of a train-the-trainer course. Long intense: (1-2 week event ~ 40-80 learning hours): Beyond the basic skills, it allows for some of the more complex interpersonal topics that a trainer needs to master, such as group dynamics, group facilitation and interaction. Trainees are usually expected to design and deliver sessions on a wide range of non-technical topics (e.g. “soft skills” training sessions). This format is particularly useful if your group of trainees will work together in the future, as the length and intensity of the event will accelerate their team development. 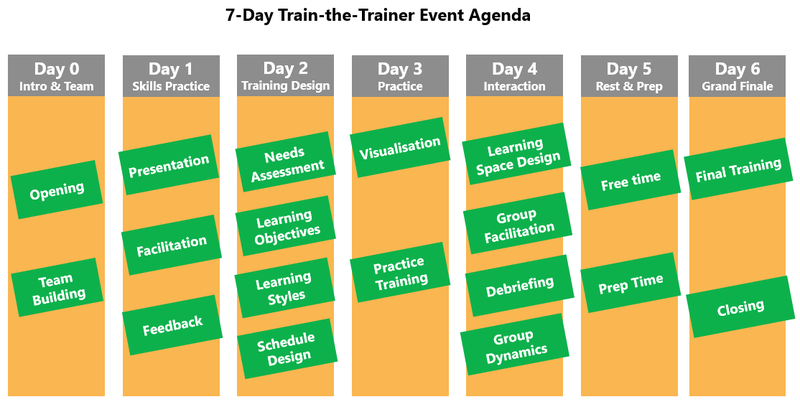 While there is no single best way to design a train-the-trainer event for each of the categories above, we have created a high-level template agenda to show the essential topics we would include in a train-the-trainer program over the course of a week. The agenda below is optimised for a live week-long event, but you might also break this down into smaller blocks over a more extended period. First, let’s start with the length of the event. 7 days? That sounds like a lot of time to ask of both participants and the organisation. And funding such an initiative is a big commitment. Remember, the people you train to become trainers themselves will make a tremendous impact on your organisation. They will likely train hundreds of people each year. That adds up to thousands of employee hours spent on training. Makes sense to ensure they will be trained by someone competent, right? Day 1: Practice and improve the essential soft skills required for delivering training sessions: presentation skills, facilitation skills and giving effective feedback. Day 2: Trainees will be introduced to essential training design principles and will design the agenda for their first Practice Training session. Day 3: The focus is on equipping your trainees with practical skills for creating and using visuals in their upcoming training sessions and giving useful tips on how to manage the delivery itself. In the afternoon, everyone has their Practice Training delivery session and receives feedback from the trainers. Day 5: Time for a break! – Give your trainees a mental break by taking the morning off. The second part of the day should be used to prepare for their final training delivery / exam. Day 6: Your trainees deliver their Final Training session (2-hour sessions) and receive feedback. You finish the day highlighting their future path and opportunities as a trainer in your organisation. Close the event with a neat official ceremony. 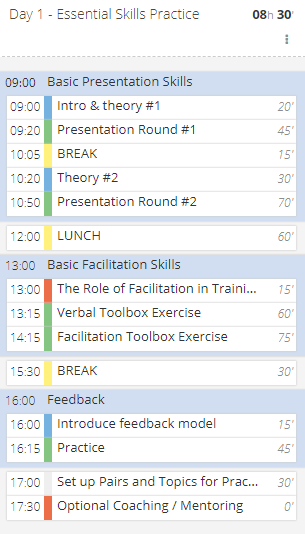 Check out the detailed schedule and download the complete train-the-trainer event agenda template in SessionLab. And now, let’s dive into a day-to-day breakdown of the agenda with a detailed explanation about what each session is for. Every training course needs a proper framing, and it is no different with a train-the-trainer event. This is the right moment to present the agenda and discuss the expectations you have of your trainees. Make sure also to discuss the expectations the trainees themselves have of the course. One of the beauties of a train-the-trainer course is the ‘meta aspect’ of each session. Whatever you do as a trainer during a particular session does not only serve the purpose of that specific session, it also models to your trainees how to do certain things as a trainer. To demonstrate how to collect, review and align expectations at any given training session. Pointing out this ‘meta’ aspect of the course instantly makes the whole course more fun and complex for your participants. Beware: trainees still primarily need to be active participants in your course and not just observe the process from the outside. This is important to emphasise whenever you want to shift attention to the ‘meta-process’ of a particular session. It is always useful to have some time dedicated to team building before things get serious and the intense learning begins. Team building activities enhance group cohesiveness and help participants get to know each other. It is often an integral part of training courses because it creates a safe, welcoming atmosphere and helps participants check in to the event mentally. This is an important learning point for your trainees. Now, should you plan just a few activities to warm up the group and break the ice, or do you need a more elaborate process to facilitate the forming of a real team? This really depends on what your organisation needs. If the group of trainees will be working together in the future, then you might want to put an extra accent on team building. Also, if you want them to have stronger peer support at the beginning of their ‘career’ as a trainer, it is useful to give the bonding process a boost. Lastly, it is highly useful for your participants to experience a few practical team building activities themselves so they will already have a few familiar tricks up their sleeves when they need a team building game for one of their future sessions. We have also included an optional exercise for the welcome day – an opportunity for trainees to get on the stage and a chance for you to assess their skills. This exercise requires that you give trainees an assignment well before the course starts – to prepare a short presentation or knowledge transfer session on a topic of their expertise. During this intro day, participants are given the opportunity to present what they prepared. You might even brief them to facilitate a short discussion afterward so that you get an initial idea of what their facilitation skills are like. And the big benefit is that it enables you to tailor the next day’s skill development session to their specific needs. In general, this intro day may range anywhere from 1-2 hours to a full day. If you need to do thorough team building and want to take advantage of the initial presentation activity, then you may take the whole day. Otherwise, you can just do the essential Introduction and Expectations sessions to kick off the course. your participants work on an exercise either alone or in groups. For the first two categories – beyond some degree of subject matter expertise – you will need to be able to present and facilitate effectively. This is why we have included one session to focus on presentation skills practice and another session to cover the most essential facilitation skills. As a trainer, you will frequently have the responsibility of standing in front of the room and presenting material. The amount of time you spend presenting theory as a trainer may vary largely on the types of training sessions you will run. But in any case, it is important to have solid presentation skills to be able to introduce concepts and theories in an understandable, structured way. The point of this session is to practice both how to structure a presentation and to practice different aspects of presenting, such as body language, voice and eye contact. Your trainees should get an opportunity to deliver short (a few minutes) presentations in front of each other and receive feedback from the group on their performance. So, after learning some tips from you, they will have another round of presenting and receiving feedback. It is best to do this exercise in small groups of 4-6 participants. This allows sufficient time for everyone to practice presenting, and you can also assign each ‘audience’ member to observe a different aspect of the presenter’s performance (e.g. body language). Facilitation skills are essential for any session, but especially for in-classroom trainings filled with human interaction. The focus of this session is to practice the ‘soft skills’ aspect of facilitation, that is, the various small tools and methods that a trainer may use to interact with the group, facilitate a group conversation or lead a debriefing session. There is a separate session on Day 4 to introduce further facilitation techniques to expand trainees’ ‘facilitation toolboxes’. Those techniques are considered ‘hard skills’ where the focus is on understanding the process of running an activity (Brainstorming, Brain writing, Six Thinking Hats, 1-2-4 Dialogue, etc.). In contrast to that one, in this session, trainees will practice essential verbal skills, such as Probing, Rephrasing, Redirecting questions and comments, and so on. Importantly, each trainee should have an opportunity to facilitate a group conversation during the session. While they facilitate, they should apply the various facilitation techniques they have learnt. Design a session that covers the basics of presentation and facilitation and includes plenty of opportunities for practice and feedback. This allows everyone to learn tips and tricks from one another, and more experienced trainees can help younger ones. Split up your participants into smaller groups based on their experience / skill level and have differentiated sessions for beginners and those with experience. Keep in mind, this requires that you really have a prior opportunity to properly observe and evaluate the skills of your trainees before the session. It is very important here that you as the trainer evaluate participants personally and do not rely solely on self-evaluations from the trainees themselves. Lastly, you can benefit a lot from a short session that gives a shared baseline for your preferred method of giving feedback. People often have very mixed views about feedback, so it’s useful to get everyone on the same page and use one (or a few) models consistently during the event. Whether you choose ‘I-statements’ or any other method, the point is to have a short and effective practice session. One of the most essential skills for any trainer is to know how to structure and build a training session to be engaging and effective. It is important to understand the basics of how people, particularly adults, learn, what kind of learning styles they may have, and how to design a training program that respects different learning styles while also covering your learning objectives. Learning Styles: introduce a learning styles theory (for instance, Kolb and 4MAT) that you prefer your trainees to follow. 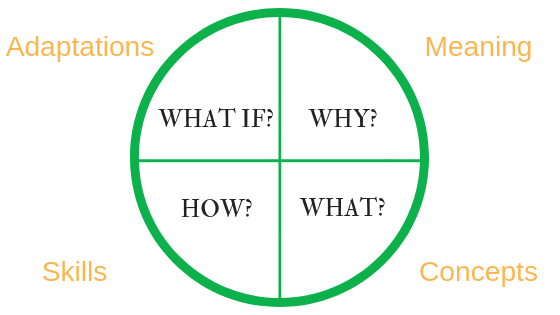 Guide participants through the design process with this framework. Before jumping into the detailed design of this day’s agenda, let’s have a quick look at adult learning. There are a few general principles that can help you orientate yourself while designing your training sessions for your train-the-trainer course. When we learn as adults, it is a different experience than when we were children. We are better able to make decisions, draw conclusions, and recognise patterns. We are less likely to do something just because, because we expect logical reasons and arguments to do it. Malcolm Knowles, an expert in adult learning, identified four principles that help us create an environment where adults learn best. Adults need to be involved in the planning and evaluation of their training. Experience, including mistakes, provides the best basis for learning activities. Adults are most interested in learning subjects that have immediate relevance and impact on their job or personal life. These are key principles that should always be kept in mind when designing training sessions, so getting these clarified early in the training program gives a useful reference point. And now let’s review how to proceed with a full day that is dedicated to the topic of Training Design. Before you start preparing for any training project, you need information in order to know exactly what is expected of you. You need to understand what the needs of the participants are: what are their current situations, and what do they want to improve? Needs assessment is an analysis conducted to determine what kind of needs exist in a group/organisation and if the training is the best possible way to solve these needs. Sometimes a training is not going to fulfill certain needs, and this is something that must be considered by, and communicated early to, your trainees! Trainees should also understand that it is their responsibility to communicate their own needs for the needs assessment and to establish good communication with the sponsor / requestor of the training. How long the training event is – How many hours is the effective training time? You can explain to your trainees that the methods of their needs assessment will primarily depend on the time they have and the availability of their future participants. Surveys and interviews with key stakeholders, including the sponsor of the training and key participants, are essential tools toward getting a good understanding of the group’s needs. When there is finally enough information to work with, it is time to craft that information into learning goals. Course Note: Due to the constraints of this specific train-the-trainer course (participants have already picked the subject of their practice delivery by this time), trainees will not have the opportunity to do a real needs assessment here. So, the focus of this session is to communicate the proper mindset and approach to needs assessment. Every training session needs clear Learning Objectives, and in this session trainees will practice how to formulate sound Learning Objectives. Fulfilling the Learning Objectives will be the most important guideline for the rest of the preparation process. In fact, as a principle, your trainees should learn to keep their Learning Objectives fixed and the content and process flexible in order to facilitate great learning experiences. In general, the Learning Objectives should come out of the needs assessment. It frequently happens that you can’t address every need and expectation, but that’s perfectly okay. It is better to have fewer goals that are attainable than have too many goals and shift the topic every 15 minutes. A practical way for your trainees to familiarise themselves with setting learning objectives is if they start working on their Practice Training and set the relevant learning objectives. When setting up Learning Objectives for a training session, they should be measurable, so the trainer can decide at the end of the training if the goals were achieved or not. Giving your trainees an exercise to set up their SMART goals will help make objectives measurable so they can decide at the end of the training what went well and how to improve on the session next time. If you prefer a different method to set goals, then go ahead with that one. The essence of this session is the importance of just setting goals, even if they’re based on a different model. When dealing with a group, it is essential to know that most people learn and acquire knowledge in their own way. To fully involve everyone in a training session, trainers need to create an environment where every participant is able and welcomed to learn. There are various popular theories about learning styles that respect the diversity of people’s preferences when it comes to learning: Kolb’s learning cycle, the 4MAT model, Fleming’s VAK learning preferences, The 7 Learning Styles – the list could go on. Often times, an organisation may already have a preference for a model they already use for planning training programs. If not, then you have an opportunity to choose which model you prefer! For this template agenda, we would go with either the Kolb cycle or 4MAT. 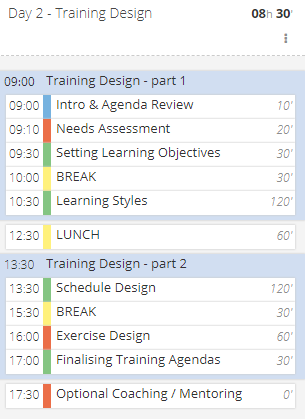 We have found that they work well for teaching structured agenda design at train-the-trainer events where there are time constraints, as in our course agenda. If you have already chosen a different one, just switch to the model you prefer in this block of the train-the-trainer event. What is important is that your own trainer team must be confident and knowledgeable in using the learning styles framework you choose. David Kolb created his learning styles model more than 30 years ago. His experiential learning theory works on two levels: a four-stage cycle of learning and four separate learning styles. The Kolb cycle emphasises the cognitive process of how people go through an experience to form patterns based on that experience. Therefore, the Kolb learning style theory is presented as a learning cycle with four stages where learners should go through the full cycle. Testing the hypotheses in future situations (based on the conclusions generated), resulting in new experiences. It is important to ensure that activities in a training session are designed in a way that allows each learner to engage with the content in the style that suits them best. 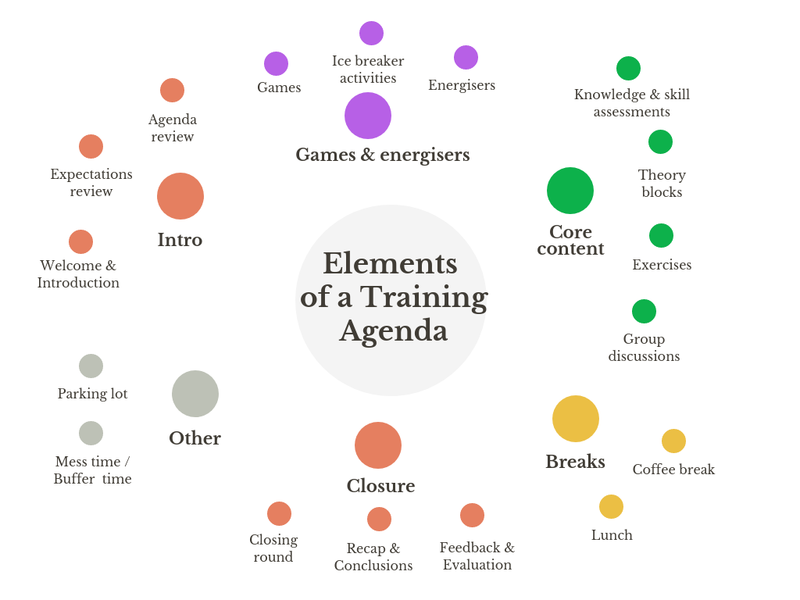 Ideally, a training session agenda should be developed in a way that includes each stage and offers a balance of these stages in the process. 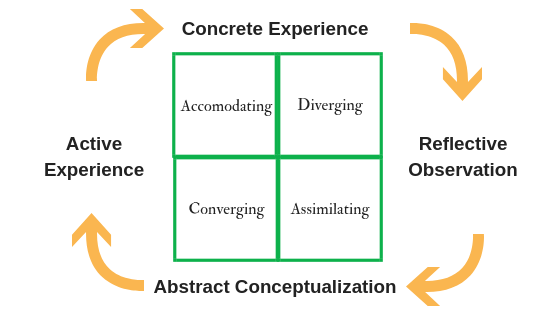 Kolb’s learning theory also sets out four distinct learning styles that are based on the experiential learning cycle. These learning styles are determined by two fundamental aspects: how we approach a task and what our reactions to it are. You may dive deeper into individual learning styles, although it is important to note that the key takeaway here is the balanced design of a training session. Primarily, the role of the Kolb cycle is to provide a framework for you and your trainees to include activities in a training plan in a way in which participants will have the opportunity to engage with a concept in different ways. In the case of 4MAT, the emphasis is more on ‘learning preferences’ than ‘learning styles’, which helps to avoid labelling learners with a particular learning style. Regarding training design, the underlying idea is very similar to the Kolb cycle. When designing a training session, try to incorporate the complete 4MAT cycle for each learning block you have. Provide the theory, and explain what the concept is. Give opportunities for participants to practice how to apply the knowledge they have learnt. This practice may take place with close mentoring, as the focus here is on learning a particular skill. 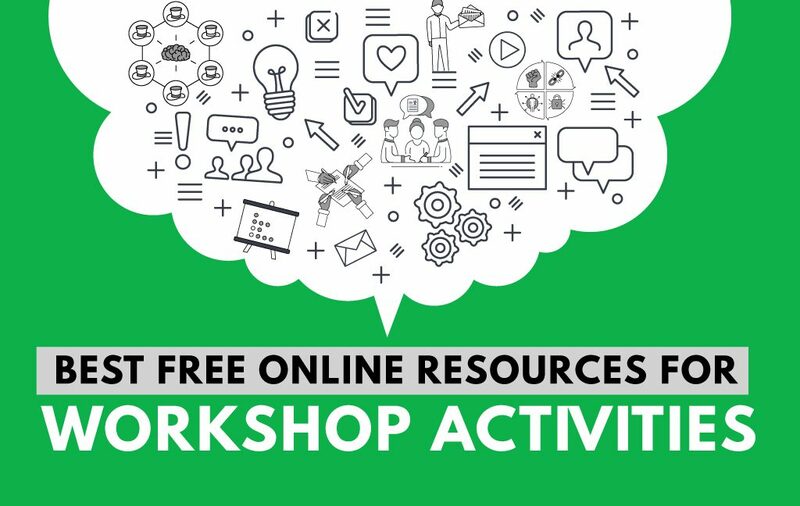 Provide an opportunity for participants to adapt the freshly-learned skills themselves. What if they try applying their new skills in a new context? You may find more details on the 4MAT framework at the 4MAT for Education and 4MAT for Business sites. Which Learning Styles theory should I go with? Are Learning Styles a myth? Are they worthy of the time and effort at all? There is a long-standing controversy about the validity of learning styles theories. Resources are readily available about debunking learning styles. They also often include debates, or in better cases, interesting and engaging discussions on the matter – as on Cathy Moore’s blog. As a trainer, it is your responsibility to take your own professional stance on the topic of learning styles. While opinions may vary, there are some takeaways that might be helpful for your trainees. Possibly the biggest misuse of learning style theories is to label learners with a particular learning style. This often encourages them to resist certain exercises that they consider not aligned with their learning style. At the end of the day, though learning styles theories have been supposedly ‘debunked’, they do provide a framework to help trainers get a handle on designing an interactive and balanced training session. The essence of applying a particular learning styles theory should be that you provide multiple ways for your training participants to familiarise themselves with the topics you are teaching and to demonstrate their understanding of those concepts. So to sum up the Learning Styles discussion, make sure you teach your prospective trainees to provide multiple ways to engage with a topic in the training sessions they design. Rather than trying to provide instructions tailored to an individual participant’s learning style, offer a variety of learning experiences/techniques within a training session. In this detailed session plan about Training Design, you will find a specific example with detailed steps on how to run a learning block on Learning Styles. Your trainees should get the opportunity to start designing their own session plan, familiarise themselves with either the Kolb cycle or the 4MAT cycle, and then re-design their own session outline based on what they have just learned. After learning about the preferred learning styles theory of your course, trainees will start completing their training agenda for the Practice Training. They should get an overview of what it takes to prepare a complete training agenda and then start working toward achieving it. This is a very practical session where trainees are presented with the variety of different training modules they might use in a training session, such as agenda review, collecting expectations, group discussions, coffee breaks, etc. Discuss each item briefly, and share best practices on how to calculate and manage timing during training design and delivery. The only exception is the main exercise which can be left as a placeholder at this point since the next session is about Exercise Design. You may also Introduce a training agenda template that all trainees should use to complete their session design. Having a consistently-used template by trainees will make it easier for your team to monitor the preparations and provide mentoring as needed. You may choose our SessionLab template, a tool specifically developed for training design, or any spreadsheet template you prefer for this purpose. Exercises are an integral part of any experiential learning activity. While designing effective experiential learning exercises requires a lot of practice and experience, you need to start somewhere. This session will be a starting point for your trainees in understanding the types of exercises they might use and how to design them. You should provide an overview of the types of exercises in a training session and give guidance on how to choose the right type of exercise. Your trainees should have practical working time to design the main exercise in their Practice Delivery, and your team of trainers must mentor them and give useful tips on designing exercises that achieve Learning Objectives. 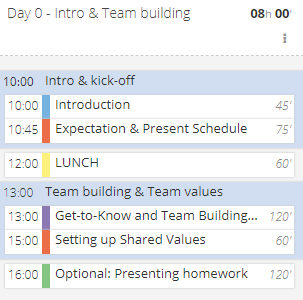 The highlight of this day is the first big practice opportunity for trainees to deliver their own training sessions, or to be precise, to practice an abbreviated session, since the 45-60 minutes they have available is really just enough for the one learning cycle that they designed the previous day. Before the Practice Training sessions start, there are still a couple of practical sessions left to help trainees get prepared. 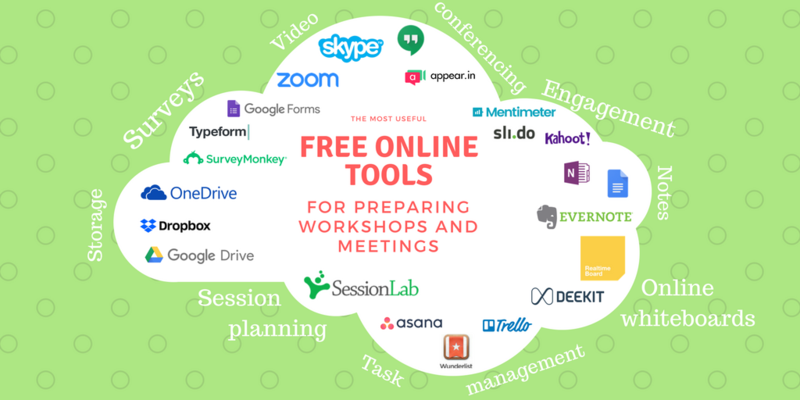 The goal of this session is to give an introduction to the visualisation tools and techniques participants may use when delivering their training sessions. It is worthwhile to introduce the most common practices for using visuals in a training session (flipcharts, whiteboards, and PowerPoint or Keynote). As we often do, in this introductory train-the-trainer course we will focus on actionable advice, so the emphasis is on giving practical tips and suggestions for each visualisation method. Lastly, before the Practice Training deliveries start, there is a short session that will provide some practical suggestions for trainees related to the in-classroom training delivery. There are a lot of small details to pay attention to when running a session, ranging from logistics issues (making sure that all materials needed are taken care of, the room is set up, and other common issues) to body language during the session. These are the final suggestions for trainees before they start their first Practice Training Delivery! Practice makes perfect – that is why you will see two occasions in this course where participants get the opportunity to design and deliver their own training sessions. This first one is only a short practice (a 45-60 minutes training module) but should be sufficient for your participants to apply training design principles, practice the art of delivering in front of other participants, and get candid feedback on their performance. Trainees should co-deliver in pairs, and you should make sure that each pair has a trainer from your team observing the session. Depending on the number of your trainees – in our case, 16 trainees – this probably requires two rounds of delivery. One small but very important thing is to make sure that you have volunteers (not trainees) organised who will attend the Practice Training sessions, so every trainee has an opportunity to practice in front of a real audience. The goal is fairly straightforward here: get a real delivery experience after trainees have built up their session design, and then provide detailed feedback on their performance so they know what to focus on for their Final Training at the end of the course. If you have a coaching / mentoring program running throughout the course, which I definitely recommend, you may close the day with optional coaching or mentoring sessions to provide individual or peer group support. There is so much that must be done for an engaging training session beyond just a trainer stepping on the stage, sharing knowledge and facilitating exercises. A lot of this is ‘soft’ stuff and comes with years of practice. So, this day is dedicated for all the soft trainer’s skills that make a well-designed session run smoothly in the classroom where flesh-and-blood participants interact with each other and the trainer. The truth is, many of the subjects that we touch upon this day can be their own subjects of advanced train-the-trainer events. Debriefing an experiential learning exercise, group facilitation and team dynamics – each are highly complex topics, and covering them in-depth during a single day is not a realistic endeavour. Now, consider that your trainees are on their fourth day of a really intense learning experience, and they still have their final training delivery session in front of them. What you really want here is to give them instantly actionable knowledge and tips in order to make their deliveries properly interactive. After they graduate from this starter train-the-trainer course and have already delivered a few dozen training sessions of their own, then it is probably the right time to dig deeper into the subtler aspects of experiential learning and group dynamics. By then, your trainees will have their own real-life experience to reflect upon. This session will focus on teaching the fundamentals of how to arrange the classroom to facilitate an interactive learning experience. The way the room is set up will influence the interaction within the group and the participants’ learning process. For instance, having the session’s flip charts on the walls around can help remind participants of the essential theory of a session. A set of flip charts full of post-it notes created by participants themselves during exercises can provide a sense of creativity and progress. 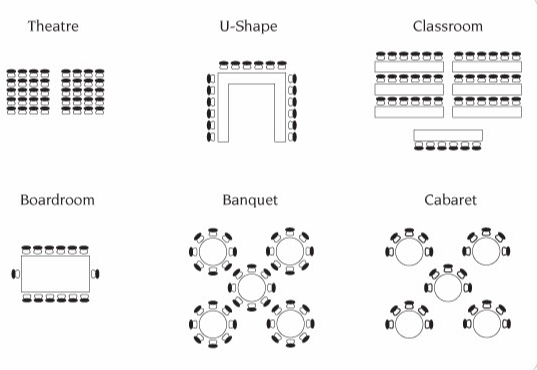 Table and chair arrangements likewise affect the learning process, as do the kinds of settings you use for group work and individual presentations. It is essential to have enough room for people to do interactive exercises in groups without feeling chained to their seats. During this session, if location permits, try out the various set-ups with your participants. Discuss the characteristics of each room set-up and which arrangements are best for which activities. 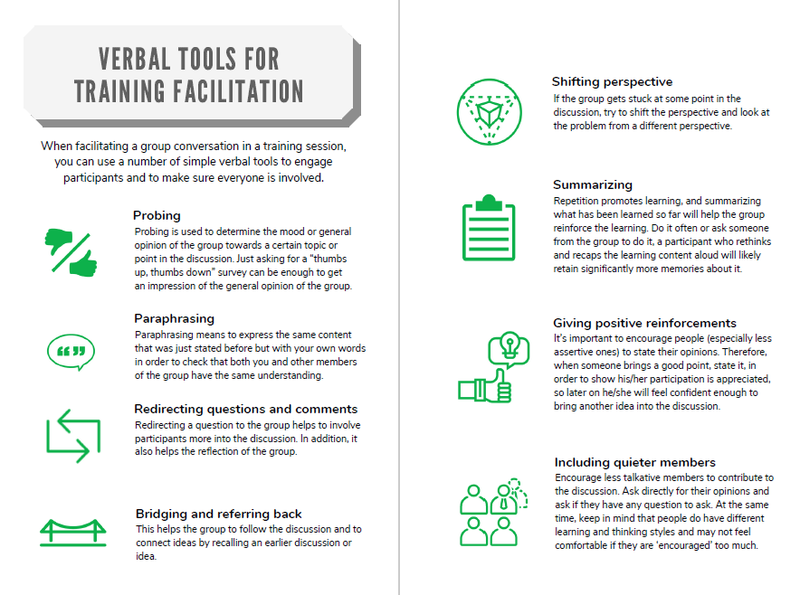 To keep a group of participants engaged throughout a training session, a trainer needs to have a solid toolkit of facilitation techniques at hand. Using different group facilitation techniques is essential to having a balanced interaction during a training session. There are also practical combinations of the techniques above, such as the 1-2-4 Dialogue method, idea generation techniques and decision-making techniques. You may also introduce facilitation techniques that help to manage bigger groups, for example, World Café, Rotating Flipcharts and Open Space Technology. Growing one’s personal toolbox is a continuous personal development activity for a trainer, and this session should pique their interest beyond the starter kit. Optionally, you may also introduce the VAK (Visual, Auditory, and Kinesthetic) Learning Styles concept as a supplementary theory to help trainees in thinking about how to keep a session interactive for participants with varying learning styles. We’ve established that managing the attention and energy of people in the room is an essential responsibility of trainers. Beyond generic tips on how to keep up engagement and monitor the energy/attention level in the room, this session also covers how to deal with difficult participants and handle conflicts in the classroom. When people from different backgrounds and life experiences meet to go through an intense learning event, there will inevitably be various reactions. Some might sit back, others will fully engage, and there will be some who will adopt blocking roles. This is a natural response to some sessions or specific tasks, so it is important that trainees be prepared to handle such situations. These are situations with which most everyone has some previous personal experience, so a structured sharing session can be the right approach to leverage trainees’ existing knowledge. If you look for a specific exercise to address challenging behaviours during a training session, then you might find useful the group exercise “Participants from Hell”. 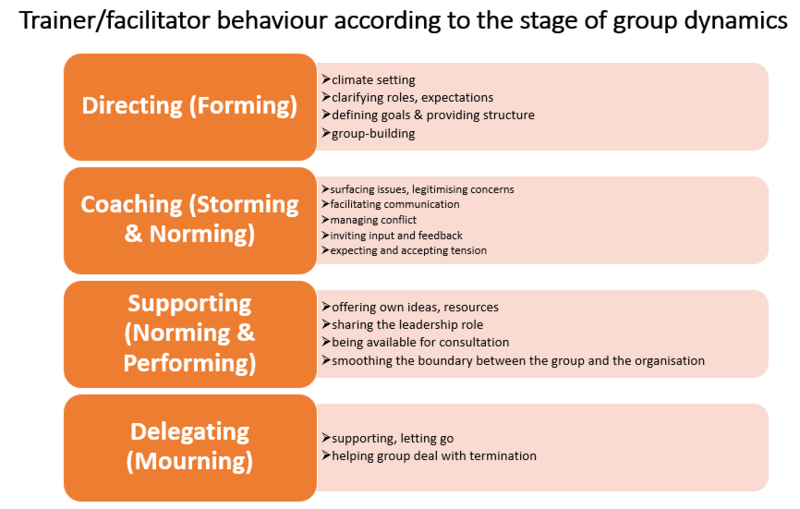 It gives a handy framework for letting participants brainstorm rules or guidelines for handling different kinds of disruptive behaviours. This is a structured sharing activity that enables us to explore techniques for handling participants who disrupt interactive training sessions. Different teams receive envelopes labeled with different types of disruptive participants. Participants brainstorm guidelines for handling disruptive behaviours, record the guidelines on a card, and place the card inside the envelope. Teams rotate the envelopes and generate guideline cards for handling other types of disruptive participants. During the evaluation round, team members review the guideline cards generated by other teams and identify the top five suggestions. If you want participants to achieve long-lasting learning in any training event, then experiential learning is a very effective way to do that. 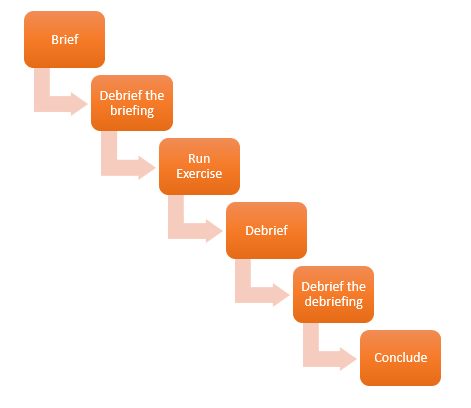 In this segment, your trainees will practice how to brief and debrief an experiential learning activity..
Debriefing is the key that enables participants to identify and connect lessons from workshop or training activities to their real world. We suggest a practical debriefing exercise for this: conduct a real experiential exercise during this session, then focus on the experience of how the briefing and the debriefing were done by the trainers. This way participants will have the chance to first take part in a debriefing as participants and then analyse the experience they just had. Using questions is essential during a training session, especially during a debriefing session. Give an overview of good questioning techniques and how to ask questions properly. In addition, if your trainees are also expected to coach or mentor other people in the future during their career as a trainer, you may dedicate more time on how to use powerful questions effectively in coaching / mentoring situations. Group dynamics play an important role not just in the training room but in our everyday lives, too. As a trainer, it is highly useful to be conscious of the dynamics taking place in the group and to be aware of the best ways to deal with a group depending on its dynamics. In this session, therefore, we introduce the topic of group dynamics and its influence on the training process. A 90-minute session, as scheduled in our template agenda, gives only enough time to scratch the surface of this topic. Actually, this is an excellent topic for an advanced train-the-trainer course, where participants already have hundreds of training hours behind them and thus many personal experiences to refer to . But until then, you have to start somewhere, and this is the point for that. The commonly used Tuckman & Jensen group dynamics theory, although mostly applicable to teams, may also be used in the training field to explain processes happening within groups going through a long-term training program. This theory also supports a common view on how a trainer should react throughout each stage of the process. Aside from starting this session with group dynamics theory, the lesson should be tailored to the group’s needs. For example, you may decide to deliver a sharing and reflection session so participants can reflect on their own group development supported by elements of group dynamics theory. Of course, your trainees won’t become masters of group dynamics immediately after this session, but they can learn the importance of observing, and reacting to, the dynamics in their own future sessions. By this point, your trainees have gone through over four very intense days of learning and self-development. It is time to give them a short break before they set out to prepare their Final Training which they will deliver the following day. It might be tempting for you to try squeezing in more content with another session in the morning. However, our experience is that trainees do reach the tipping point by this day, and some real mental rest helps them to process the learnings of the course so far. Offering individual free time is one way to go; however if your setting allows, it is best to organise a group leisure activity – something that keeps trainees both physically and mentally busy (e.g. some kind of outdoor activity). 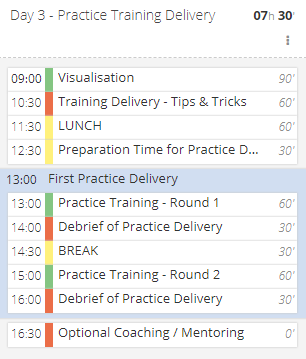 Here’s one tip that might come handy: if you truly want to give space for your trainees to recharge, don’t brief about tomorrow’s Final Training Delivery details yet; save it for the afternoon. Fresher minds will be more effective in tackling the job. Or you might poll participants by the topics that each of them prefers to deliver. They won’t have too much time to prepare, so they should be comfortable with the topic of their training session in order to save their focus for the process instead of the content. After pairs and topics are set, trainees can start preparing for the Final Training Delivery, which will be a 2-hour training session. There is half a day dedicated for preparations. Make sure to have a mentor assigned to each pair who will keep an eye on the training design process. Mentors help whenever trainees are stuck and should make sure that everyone gets a sound training agenda designed by the end of the day. Lastly, the Final Training Deliveries will take place in two rounds where everyone will be the trainer in one of the rounds and a participant in the other. To help trainees sign up themselves, create a schedule of the Final Deliveries so everyone can see when they deliver their session and so they can also sign up as participants for one of the sessions in another time slot. Make sure that you get further participants for the Final Deliveries the following day, not only your trainees, and that those people are also distributed evenly between the Final Deliveries. This is the last day of our program, and time for trainees to put into practice everything they have learnt over the past days. The highlight of this day is the Final Training Delivery, where trainees conduct one more session to practice their freshly-gained interaction skills and to implement the feedback they received from their first delivery. Similarly to the Practice Training three days before, the scheduling of these sessions depends on the time you have available and the size of your team. Trainees should again deliver in pairs to practice the experience of co-delivery, and it is essential that one trainer from your team is there to observe and give feedback on the performance. 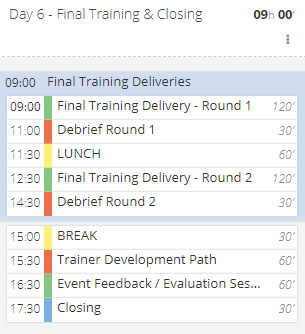 In our example template with 16 participants, we have split the Final Training sessions into two rounds of 2-hour deliveries, each followed by a round of feedback. You may even decide to record the session if you want to provide really thorough feedback by your whole team of trainers. The ideal length of this session is somewhere between 2 and 4 hours – that should give trainees a thorough and hands-on experience of how it feels to deliver a complete session. This is the main assignment of the course, and completing it will provide your participants with a sense of accomplishment and closing. Your trainees have practically completed the course and passed their Final Delivery by this point. This is just the beginning of their journey as a trainer, and now it is time to point out the various development opportunities they will have in your organisation. Present the skill development opportunities your trainees can have in the future (including further training opportunities, advanced train-the-trainer courses). Discuss how they can keep supporting each other in their development path after this course is over. Present future expectations and practical next steps they will have as a trainer in your organisation. As the event winds down, there will be a few formal but important steps left. Firstly, make sure that your trainees take the time to reflect upon the week’s program and share their feedback on how to improve your train-the-trainer course for the future. You may provide them with a detailed survey soliciting answers around the various aspects of the event and their learning journey. These evaluations should give you useful insights on how to adjust the agenda and scope of your train-the-trainer event next time. Don’t forget to schedule time with your own trainer team, too, after the course is over for an evaluation round. Lastly, prepare a nice, official closing ceremony for your trainees and hand out certificates for completing the course. They went through a really intense learning process and hopefully built bonds with their fellow trainees that will support them in their upcoming careers as trainers. Your trainees worked hard! Now celebrate the beginning of their journey as a trainer! I hope you enjoyed this train-the-trainer design guide and that it gave you some inspiration. Keep in mind, there are a lot of different options for designing and running a train-the-trainer program. You can have shorter events, or you can have a more extended program scattered over several weeks. You may go more in-depth on certain topics, such as learning styles or group dynamics, and you may set aside some topics as follow-up rounds in the form of an advanced train-the-trainer course. You may even combine online and offline learning in a course. Ultimately, it is your own organisation’s needs that should determine what the best formats are for you to teach capable new trainers. For this reason, you should not spare running a proper needs assessment before jumping into the exciting work of designing a course agenda. 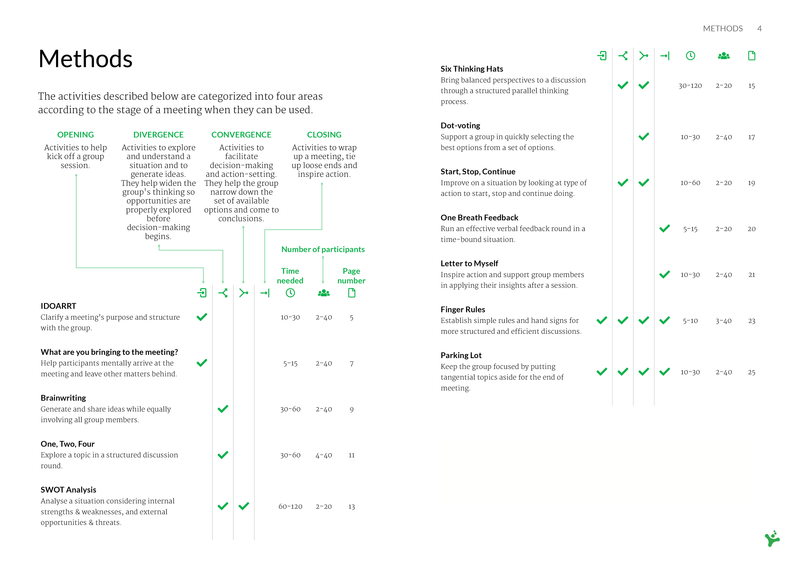 Did you find this design guide useful? Do you want to build on this agenda? 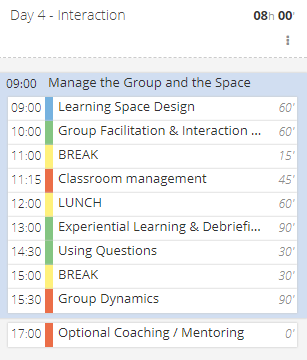 We have made the complete train-the-trainer event agenda template open and ready to download for you in SessionLab! Do you have any questions about designing train-the-trainer courses? Anything specific about this 7-day course template? Or maybe you have a cool tip that we didn’t include here. Either way, let us know by leaving a comment below. I was of late ran over your website and have been perusing along. I thought I would leave my first remark. I don’t realize what to say aside from that I have delighted in perusing. Decent blog. I will continue going to this online journal frequently. That’s great to hear, Gina, I hope you’ll find many useful facilitation and training tips on our site! Robert, that is fantastic blog. Thanks for sharing. You’re welcome, Juliana – great to see you enjoyed reading it! Great content, diverse and well researched. Thank you for sharing! Dr. Pascoe.